2 0 1 9 J A N U A R Y P R I N T W E A R 3 5 paper, apply a heat-activated adhesive, and then ship that paper with ink and adhesive to you to be applied using your heat press. One of the big benefits of screen-print transfers is that you don't have to screen print your shirts in advance and commit a certain design to a certain style shirt in a certain color and a certain size. This is where the on-demand nature of the screen- print transfer really shines. You can design your artwork and choose colors that can apply and look good on various color shirts. It should come as no surprise that the best selling colors of screen-print transfers are white and black. White will apply and look good on al- most any medium- to dark-colored shirts and black will fill in the gaps that white doesn't cover. Let's build a made-to-order example to see how you can create screen-printed on- demand apparel. The best scenarios for made-to-order shirts come from online shops or events because the most impor- tant part of a made-to-order business is having traffic that wants something made on-demand. The traffic will most likely be fragmented by both time and demand. Fragmented by time simply means that customers will come in spurts. Fragment- ed by demand means that some will want one thing and some will want another. That's the nature of the made-to-order business. Our best bet is to provide options that al- low for some creativity and choice but not so many options that it becomes difficult to manage the different designs, colors, styles, and sizes. A good rule of thumb is to pro- vide three apparel choices with no more than five designs that can be applied to those different apparel items. We want to create a customization ex- perience that allows someone to walk away with something they created but not so unique that we are recreating de- signs for every person that visits your pop-up shop. You can choose to display the apparel items by demographics like men, women, children, or unisex styles that can be presented in a good, better, best format. When choosing your designs, make two to three for full front or full back placement and two to three for a left chest, back yoke, or other unique placements. This will give your customer the ability to place multiple designs on the same item, increasing the customization combinations while keeping your unique inventory items to a minimum. Your heat press gives you the ability to ac- commodate almost any placement that your customer wants. 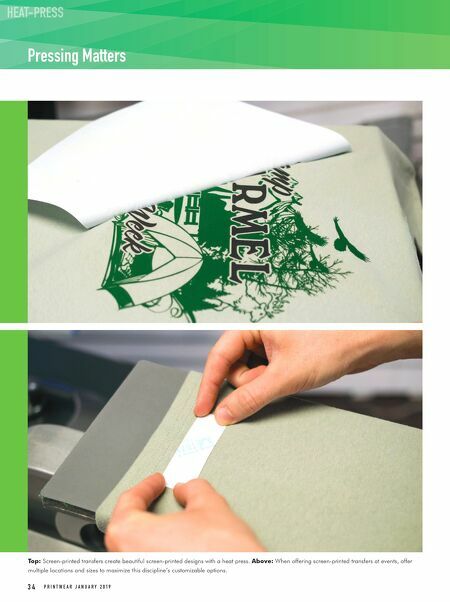 When ordering your screen-print heat transfers, most manufacturers sell by the piece and by the sheet. Purchasing by the piece will give you exactly what you order while purchasing by the sheet will give you the ability to gang designs together that share common colors. If you're going with a single-color white transfer, you can most likely fit your full front design and two smaller designs on the same sheet. This typically saves you money once you piece the sheet before the event. Once on-site, create a few sample items from your inventory. 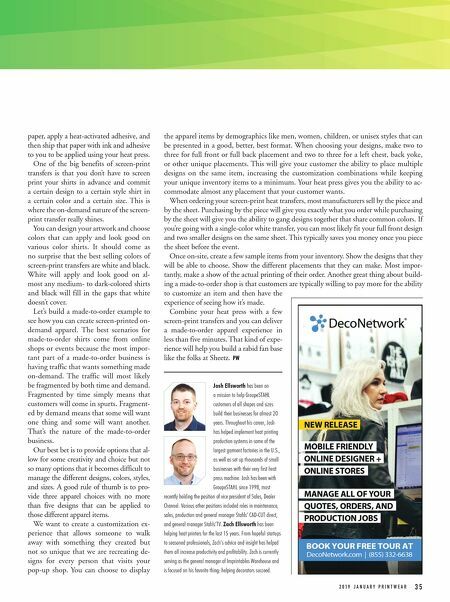 Show the designs that they will be able to choose. Show the different placements that they can make. Most impor- tantly, make a show of the actual printing of their order. Another great thing about build- ing a made-to-order shop is that customers are typically willing to pay more for the ability to customize an item and then have the experience of seeing how it's made. Combine your heat press with a few screen-print transfers and you can deliver a made-to-order apparel experience in less than five minutes. That kind of expe- rience will help you build a rabid fan base like the folks at Sheetz. PW Josh Ellsworth has been on a mission to help GroupeSTAHL customers of all shapes and sizes build their businesses for almost 20 years. Throughout his career, Josh has helped implement heat printing production systems in some of the largest garment factories in the U.S., as well as set up thousands of small businesses with their very first heat press machine. Josh has been with GroupeSTAHL since 1998, most recently holding the position of vice president of Sales, Dealer Channel. Various other positions included roles in maintenance, sales, production and general manager Stahls' CAD-CUT direct, and general manager Stahls'TV. Zach Ellsworth has been helping heat printers for the last 15 years. From hopeful startups to seasoned professionals, Zach's advice and insight has helped them all increase productivity and profitability. Zach is currently serving as the general manager of Imprintables Warehouse and is focused on his favorite thing: helping decorators succeed.